We sell A. Vogel (Bioforce) products like A. Vogel Bambu ® Fruit & Grain Instant Coffee 200g online in the UK and directly from our award-winning store in Scotland. Coffee substitute: tasty, instant and caffeine free alternative to coffee. We sell real A. Vogel (Bioforce) and other Coffee Substitutes directly from our shop in Scotland and online throughout the UK. Where can you buy real Bambu ® Grain Coffee 200g safely online? 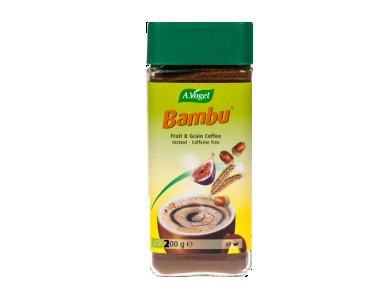 If you are wondering where you can buy A. Vogel Bambu ® Fruit & Grain Instant Coffee 200g safely online in the UK, then shop with us.